From simply finding the tenants and arranging the move-in, to overseeing the entire tenancy, we are able to offer a bespoke service to suit your requirements. Please click here to see a breakdown of our Let Only, Rent Collection and Full Management Services. What References are Taken from Tenants? Landlord’s Reference - Stating length of time at property, was rent paid promptly and condition of property at surrender. Bank Statements - last 3 months bank statements to show status of account. Pay Slips - confirming tenant’ earnings. Credit Check - Giving the applicant a credit score, how long they have been living at the address supplied and any adverse credit history. We are very thorough with our referencing procedure, as our main priority is to find you a tenant who will be able to afford the rental and who will look after your property. All references are collected in-house and are available for viewing, should landlords wish to do so. There are situations where not all of the above are obtainable and you will be notified of any exceptions. An example of this is first time workers who have been living at home and who have not rented before. How Long Will it Take For My Property to be Let? On average a property should be on the market for no longer than 15-20 days. In peak times it is not uncommon for a property to be let the same day! Properties offered in good condition will always attract suitable tenants within a few days. A property offered in poor condition would possibly take a little longer to find tenants. For advice to show your property at its best and for recommendations to make improvements in order to achieve the maximum rental potential, please ask one of our experienced staff who will be more than happy to help. What Type of Tenancy Agreement will be Signed? Tenant’s sign an Assured Shorthold Tenancy Agreement, in which Wonderlease continuously update with any changes to legal and market conditions. The minimum period is six months. The most popular length of contract is for 12 months. Most of our clients prefer the 12 months contract, which can include a break clause agreement. This means that after the minimum period (usually 6 months) the tenant or landlord may serve a fixed notice period (usually 2 months) to terminate the agreement. From the tenants’ point of view this offers flexibility, especially in an uncertain job market, and from the landlord’s viewpoint this will give us 1-2 months to find another tenant for the property. However, it is not unusual for our tenants to stay in a rented property for over 3 years. We are able to sign 18 months & 2 year AST Agreements should this be of interest to you. How Many Sets of Keys Should I Supply? We would recommend that at least 2 sets of keys are supplied to the tenants, and that a spare management set of keys are supplied to Wonderlease when we are instructed to manage the property. Please also ensure all personal items other than those you intend to leave in the property are removed. Should I Provide an Inventory? We would advise for you to carry out a detailed inventory before the tenants move in to the property to ensure a written record, signed by both tenant and landlord, is available at the end of the agreement should there be any dispute over damages. Failure to do so would put a landlord at a major disadvantage if a dispute over the deposit occurs. Wonderlease can arrange for an independent company to carry out a full and comprehensive inventory for you. We also carry out photo inventories in-house, which is included in our services. From 6 April 2007, when a landlord or letting agent takes a deposit from a tenant, the deposit must be protected in a government-authorised tenancy deposit scheme. This new rule applies to all Assured Shorthold Tenancy Agreements. 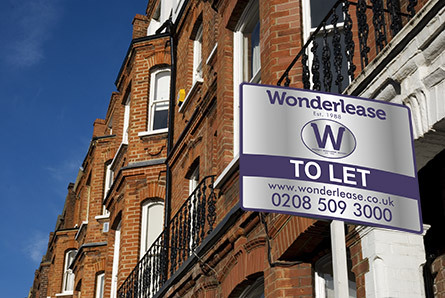 Wonderlease is a member of such a scheme and will automatically hold all tenants damage deposits unless a landlord can prove that they are also members of a government-authorised scheme. When a dispute occurs, and if landlord and tenant both agree to use the service to resolve disputes offered by their scheme provider, they are agreeing to be bound by its decision. Gas Safety (Installation & Use) regulations 1998. - All installations must be checked annually by a GAS Safe Registered engineer. A Gas Safety record must be issued every year, and a copy issued to Wonderlease & the tenant(s). The Energy Performance of Buildings (Certificates and Inspections) (England & Wales) Regulations 2007. Energy Performance Certificate (EPC) - The law requires you to provide an EPC to prospective Tenants. You must commission an EPC before the property is marketed to rent. It is your responsibility to use all reasonable efforts to obtain an EPC within 7 days of first marketing the property for rent. The Electrical Equipment (Safety) Regulations 1994, requires that all electrical equipment is safe. A portable appliance Test (PAT) should be carried out regularly. All electrical testing must be carried out by a qualified and registered engineer. The plugs and Sockets etc. (Safety) Regulations 1994. Any plug, socket or adaptor must meet current and relevant British Standards. Plugs must have correct fuse, approved adaptors must be used on appliances with non-UK plugs. The Furniture and Furnishings (Fire Safety) Regulations 1998. It is a criminal offence to let premises with upholstered furniture than does not comply with safety regulations. This law covers such items as beds, headboards, futons, sofas, scatter cushions etc. Most furniture bought since 1988 from a reputable source should be labelled indication compliance. Fire Safety in property. All properties must be fitted with mains operated smoke detectors on each floor of the building. Private Rented Property Licence - This means that owners of every privately rented home in the borough that has introduced such laws; must apply for a Private Rented Property Licence (PRPL), which will issued by the Council, unless an exemption applies. Owners with multiple rented properties in the borough must complete an application for each property. Wonderlease will help Landlords arrange for these checks and certificates to be completed upon request. For further information on any safety regulations, please feel free to contact us and we will be happy to explain in greater detail. Can Wonderlease Sell My Property Once I No Longer Wish to Let? As we have hundreds of landlords, many of whom are continually looking to add to their property portfolio, we are always able to sell any type of property with vacant possession or with existing tenants. For further information please speak with one of our managers who will be more than happy to answer any questions. We also offer a free, no-obligation rental valuation service. To take advantage of this fill out our landlord form and one of our lettings managers will be in contact shortly. Alternatively please call our lettings team on 020 8509 3000 for further information.